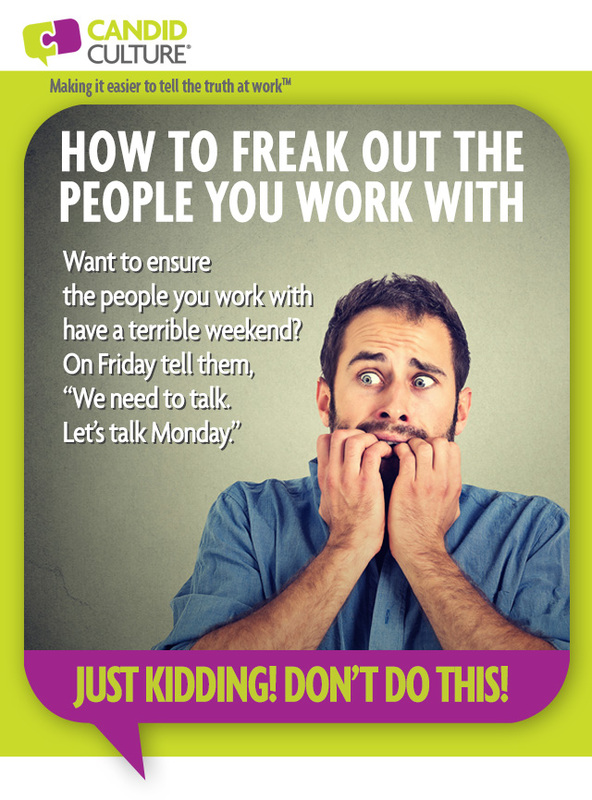 If you want to freak out the people you work with, tell them, “We need to talk.” If you really want to freak them out, say those four magic words on a Friday, or even better, the day before someone goes on vacation. “We need to talk” is rarely followed by, “and you’re awesome.” People know bad news is likely coming, and they’ll inevitably be on edge. The antidote to asking for time to talk is to create opportunities to give feedback regularly. There are many reasons giving feedback is hard. One of them is we wait too long. Something happens. We know we should address it, but we don’t want to. So we wait to see if the behavior is really ‘a thing.’ Then it happens again. And now we know it’s ‘a thing.’ But we still don’t want to address it. Then the situation gets really bad, and now we have to say something. The conversation then takes 90 minutes, is painful, and everyone goes home unhappy. Giving feedback strategy one: Debrief everything. Do a quick plus/delta on a regular basis to assess how things are going. Plus – what went well? Delta – what would we change if we could/what did we learn? I recommend doing a quick debrief at the end of important meetings, hiring processes, projects, and when anything changes. Conduct a short debrief when you have staffing changes, gain or lose a client, launch or eliminate a product or service, etc. Change is an opportunity to evaluate how you work and to make appropriate adjustments. When you debrief important events, you tell people that feedback is important and that it’s ok to be candid. Conducting regular debriefs also gives employees a chance to practice giving feedback, which is a hard skill. And like anything, the more we give feedback, the easier it becomes. Conducting short, regular debriefs is one of the easiest ways to learn from the past and become a more candid culture. Giving feedback strategy two: Schedule five to fifteen minutes each week to talk as a team or with direct reports. When you know you have time each week to talk with your manager, direct reports, and/or team members, you never have to ask for time to talk. Issues don’t build up or linger. Breakdowns and frustrations are discussed within of few days of their occurrence, and no one is on edge that bad news is coming at their end of their vacation. The key to being effective at giving feedback is to give feedback regularly. Short, frequent feedback conversations are much more effective than infrequent, long conversations that everyone dreads and leaves feeling exhausted and demoralized. Debrief everything meaningful. Meet with people weekly. Ask for and give feedback as things happen, and watch your culture change. New to management. This blog was really helpful!